GoPro Accessories. 2 x Flat surface gopro adhesive mounts 2 x Adhesive pads. 2 x Curved surface gopro adhesive mounts 2 x Adhesive pads. Laptop LED/LCD Hinge. Elastic and adjustable compact design, anti-skid gel on the back, made of superior plastic and nylon. GoPro Accessories. 2 x Flat surface gopro adhesive mounts 2 x Adhesive pads. 2 x Curved surface gopro adhesive mounts 2 x Adhesive pads. 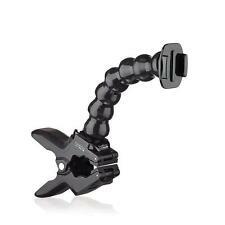 1 x Car windshield suction cup mount Tripod mount adapter. 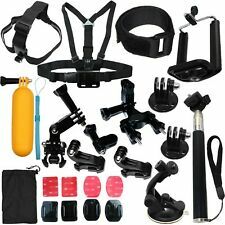 These are Genuine GoPro products. No generic crap (like all my competitors have) in any of these kits. 1 short buckle with gopro logo. 1 Long Thumb screw. For added security, the dual knurled locking ring assures a tight connection to the accessory. Note：This is not original product of Gopro. It is produced by other Manufacturer. 1 x Thumb Screw. 1 x Mount Base. Item number: 2169. Trending at $6.38eBay determines this price through a machine learned model of the product's sale prices within the last 90 days. Also perfect compatible with X-sport like parachuting, bungee jumping, air gliding and more. The adjustable blue band ensures the safety and your wearing comfortability. GoPro Hero 3/3 . GoPro Hero 7 Black/Sliver/White. Trending at $33.89eBay determines this price through a machine learned model of the product's sale prices within the last 90 days. 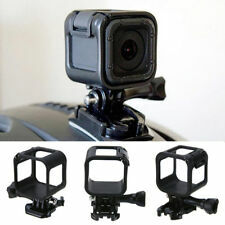 (5) Compatible with GoPro HERO5 Black/ HERO6 Black/ HERO7 Black and HERO 2018 Edition only, NOT for any other model. Fidget Spinner. GoPro Accessories. Flashes & Flash Accessories. 1x Silicone Lens Cap. GoPro Accessories. Its universal design makes. and easy for you to install. Compatible Device: GoPro Hero 4/3/2/1. Handlebar Mount. Housing For Hero 3. Clamp Mount Neck. cycling's handlebar. Gopro Octopus Tripod mount. Great way to install Gopro on your bicycle. Turn your Gopro into a Car DVR. Complete 5 PCS Gopro Dog mount. Ideal for taking video with Gopro. 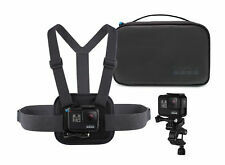 - Compatible with all GoPro Hero version 1 2 3 3 . Snap Lock Suction Cup Locks Tight. Includes 1x Suction Cup Mount (. A Locking Suction Cup Mount Allows For Great Smooth Solid Surface Mounting Great On Windshields, Windows, and Similar Solid surfaces. ). GoPro Accessories. Its universal design makes. and easy for you to install. Compatible Device: GoPro Hero 4/3/2/1. Handlebar Mount. Housing For Hero 3. Monopod Pole mount adapter. Clamp Mount Neck. 1 Long Thumb screw. 1 3M sticky. Gopro Octopus Tripod mount. Great way to install Gopro on your bicycle. Turn your Gopro into a Car DVR. Complete 5 PCS Gopro Dog mount. Ideal for taking video with Gopro. - Can securely attaches your Video Camcorder or Gopro to Bicycle handlebars. Smatree Aluminum Tripod Mount Adapter for GoPro Session, Hero Fusion, 7, 6, 5, 4, 3 , 3, 2, 1 HD,GOPRO HERO (2018), Black. Fit for GoPro Session, Hero 7, 6, 5, 4, 3 , 3, 2, 1. Made of high quality Aluminum with a Threaded End,replace the plastic tripod mount. 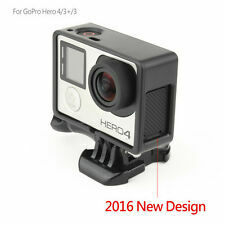 Compatible with: for Gopro Hero 4 Session, Hero 5 Session. Notes: Due to the light and screen setting difference, the item's color may be slightly different from the pictures. Compatible with: GoPro Hero 4, Hero 3, Hero 3 Models Black, White, and Silver. 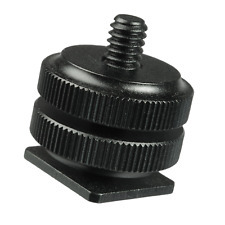 1 x 3.5mm Mic Adapter for Gopro. 3.5mm Mini USB Microphone Mic Adaptor Cable Cord. Mic Connector Type: 3.5mm Jack. USB Connector Type: Mini USB-10 Pin. (5) Compatible with GoPro HERO3, HERO3 Black/Silver/White and HERO4 Black/Silver Edition, NOT for other model. Fidget Spinner. GoPro Accessories. Flashes & Flash Accessories. Thumb Screw x 1. 1)Engineered for optimal sound at speed. Most Popular Gopro Mounting tool for dog. Mount your GoPro to your bicycle effortlessly. Simple mount Gopro with this extension bar. Did you know that Gopro can be used as Car DVR?. - Compatible with Gopro Hero 4 3 3 2 1. The Tempered Glass screen protectors perfectly fit for Gopro Hero 7 6 5. The lens cap can help keeping dust and scratch from the screen. 1 Foam windshield. 2 Lens screen protector. Reduces wind noise to enhance audio capture. Capture high-quality audio when you connect an external professional-level microphone to your GoPro with the Pro 3.5mm Mic Adapter. Enables high-quality audio capture when using a pro-level external mic. Capture high-quality audio when you connect an external professional-level microphone to your GoPro with the Pro 3.5mm Mic Adapter. Pro 3.5mm Mic Adapter. Enables high-quality audio capture when using a pro-level external mic. Mount your GoPro to your bicycle effortlessly. Most Popular Gopro Mounting tool for dog. Simple mount Gopro with this extension bar. Did you know that Gopro can be used as Car DVR?. Gopro Application on Cars. GoPro Flat Curved Adhesive Mounts (GoPro Official Mount). Compatible with a wide variety of curved and flat surfaces. Industrial-strength adhesive ensures secure mounting. Removable by applying heat to adhesive bond and peeling off mount. 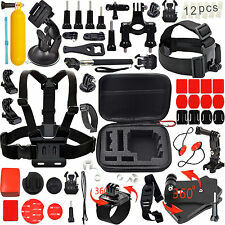 He kit includes Hot Shoe Mount, GoPro Adapter and Universal Phone Holder, can install. such as Gopro Hero 5 Black Session, Hero 4 Black and Silver Session. - The GoPro Mount and Phone Holder can be installed on tripod, and both of them can. Most Popular Gopro Mounting tool for dog. Mount your GoPro to your bicycle effortlessly. Simple mount Gopro with this extension bar. Did you know that Gopro can be used as Car DVR?. 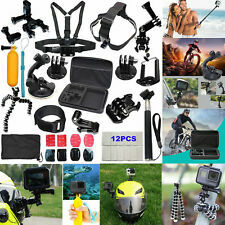 - Compatible with all GoPro Hero version 1 2 3 3 . • Adjustable base design convenient for installation on your bicycle or other objects, enjoy motion action photography. factors such as brightness of your monitor and light brightness. Give us a chance to make things right for you, and we will do our best to provide a fitting solution. 180° self photo shooting mount for motorcycle bike racing and so on. 1 x Adjustable Arm Mount Holder. -The mount can adjustable so you can achieve nearly any view angle you desire while shooting pictures or video. Did you know 3M VHB was partially developed with NASA?. Includes 2 Pair (4 Total) 2 Normal FLAT Mount and 2 Curved mounts with Genuine 3M Adhesive Backing PRE-INSTALLED on the mount for you (Shown separate for the image only). 1 x 3M Curved Sticky Mount. 3M Sticky has a strong hold. Once we receive and inspect your item(s), we will credit your account promptly. Eligibility Conditions. Under 16oz only. Gopro Octopus Tripod mount. Great way to install Gopro on your bicycle. Turn your Gopro into a Car DVR. Complete 5 PCS Gopro Dog mount. Ideal for taking video with Gopro. Long and bendable Jaw Neck Mount which will let you take video anywhere handfree.